From the very beginning it would seem that God had a plan for America. From its discovery by Europeans to its settlement, from the Revolution to Manifest Destiny, from the stirrings of civil unrest to civil war, America was on a path. In our pluralistic world, when textbooks are being rewritten in ways that obscure the Judeo-Christian beginnings of our country, the books in the Discovering God's Plan for America series help ground young readers in a distinctly evangelical way of understanding early American history. As young readers look at their nation's development from God's point of view, they will begin to have a clearer idea of how much we owe to a very few--and how much is still at stake. These engaging books bring history alive in a way that will inspire young people to do their important part in shaping this nation into the future. 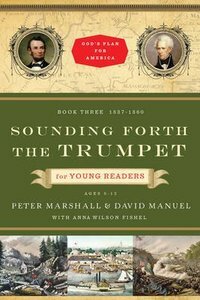 About "Founding Forth the Trumpet (1837-1860) (#03 in Discovering God's Plan For America Series)"
Peter Marshall has gained national recognition as a preacher and teacher on Christian maturity. A graduate of Yale University and Princeton Theological Seminary, he formerly served as pastor of the East Dennis Community Church on Cape Cod. Marshall lives in Orleans, Massachusetts. He is the co-author of The Light and the Glory:1492-1787 with David Manuel. David Manuel is the author or coauthor of several books, including Like a Mighty River, The Jesus Factor and The Light and the Glory:1492-1787 . He holds a BA in English from Yale University and lives in Hull, Massachusetts. Peter Marshall is a writer, historian, Presbyterian minister, teacher, and popular conference speaker. David Manuel is an editor and the best-selling author of more than twenty books. Anna Wilson Fishel, trained in law, was involved in government work but is now home schooling her children. These young readers' editions of the popular history texts reveal how God was at work in America's history from the very beginning. For ages 9-12. From the very beginning it would seem that God had a plan for America. From its discovery by Europeans to its settlement, from the Revolution to Manifest Destiny, from the stirrings of civil unrest to civil war, America was on a path. In our pluralistic world, when textbooks are being rewritten in ways that obscure the Judeo-Christian beginnings of our country, the books in the Discovering God's Plan for America series help ground young readers in a distinctly evangelical way of understanding early American history. As young readers look at their nation's development from God's point of view, they will begin to have a clearer idea of how much we owe to a very few--and how much is still at stake. These engaging books bring history alive in a way that will inspire young people to do their important part in shaping this nation into the future. From Sea to Shining Sea for Young Readers tells America's story during its first fifty years. These were the days of Benjamin Franklin and Daniel Boone, Francis Asbury and Charles Finney, Andrew Jackson and Sam Houston. During these years Conestoga wagons and circuit riders became famous, Indian wars and slavery were major concerns, and the Louisiana Purchase and the Oregon Trail expanded American boundaries from sea to shining sea. But God was also at work in the young nation, giving its settlers opportunities to shape its history and to be His people. This book brings to life the exciting era between 1787 and 1837 for young readers ages 9 to 12. Study questions and answers for each chapter and a glossary of terms are included. Peter Marshall (1940-2010), a graduate of Yale University and Princeton Theological Seminary, was a nationally recognized speaker on America's Christian heritage. David Manuel is the author or coauthor of several books, including Like a Mighty River and The Jesus Factor. He is a graduate of Yale University and lives in Massachusetts. Anna Wilson Fishel trained in law and was involved in government work. She is a published adapter and author of books for children and young adults. Peter Marshall (1940-2010), a graduate of Yale University and Princeton Theological Seminary, was a nationally recognized speaker on Christian growth and maturity and on America's Christian heritage. Anna Wilson Fishel trained in law and was involved in government work. She is a published adapter and author of books for children and young adults. These young readers' editions of the popular history texts reveal how God was at work in America's history from the very beginning. For ages 9-12. Did Columbus believe that God called him west to undiscovered lands? If, indeed, there was a specific, divine call upon this nation, is it still valid today? The Light and the Glory answers these questions and many more. As readers look at their nation's history as a part of God's plan, they will begin to have an idea of how much we owe to a very few--and how much is still at stake. The Light and the Glory for Young Readers leads children ages 9 to 12 on a journey of surprising discoveries about how God worked through the founders of America to establish this nation. From the first sighting of land to the devout Pilgrims and Puritans to the Revolutionary War, it would seem God had a plan. Young readers will love learning about the history of this great nation. Study questions and answers for each chapter and a glossary of terms are included.